Includes: Transmitter only. Tactic RX required. 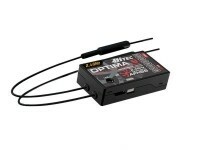 The Optic 5, 5-channel sport radio is the perfect transmitter for beginner pilots. With its simple-to-use design and advanced 2.4GHz technology, this radio will have you flying a variety of models confidently and securely from a basic trainer to more advanced aerobatic-type aircraft. Available with our Minima 6T full-range, micro receiver, Hitec's Optic 5 is your affordable and straightforward radio solution! 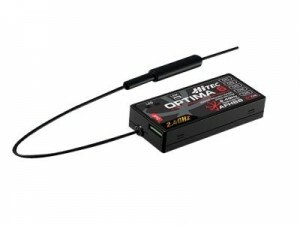 Optic 5 2.4GHz Transmitter and Receiver Combo Includes Transmitter and Minima 6T Receiver. Dry system, transmitter requires 8AA Alkaline cells. Same unit and specifications as above except comes with a lower cost 7 channel RX. Included is the Full Range 92674 7-Ch 2.4GHz Receiver. Call for todays special pricing. Hitec is proud to introduce our new flagship radio the Aurora 9. The Aurora 9 is a "pure digital" 2.4GHz system offering an extremely low latency response time for that "connected" feeling. Featuring a large back-lit 5.1 inch touch screen display, 30 Model memory, assignable switches and customizable programming menus, the Aurora is a true 3 in 1 radio with sophisticated programming for sail planes, helicopters and all kinds of power planes. With all these features and a price that can't be beat, there is no doubt the Aurora 9 will become the radio of choice for the most sophisticated pilots. Hitec is proud to introduce our new flagship radio the Aurora 9. The Aurora 9 is a "pure digital" 2.4GHz system offering an extremely low latency response time for that "connected" feeling. Featuring a large backlit 5.1 inch touch screen display, 30 Model memory, assignable switches and customizable programming menus, the Aurora is a true 3 in 1 radio with sophisticated programming for sail planes, helicopters and all kinds of power planes. With all these features and a price that can't be beat, there is no doubt the Aurora 9 will become the radio of choice for the most sophisticated pilots. 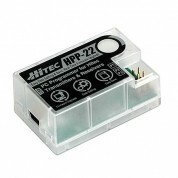 HPP-22 is the perfect companion for the latest generation of Hitec radios and receivers. With the HPP-22 and a Windows® based PC users can download the latest software from the web and setup their transmitter and receivers, save and load data or update their equipment to the latest firmware. With USB plug & play compatibility and an easy to use PC interface the HPP-22 is sure to become a must have for the Hitec user. The HPP-22 requires an internet connection to download software and a USB Cable with mini-B connector for operation. Hitec is proud to introduce their first 2.4GHz products consisting of the Spectra 2.4, 2.4GHz transmitter module and Optima line of receivers. The Hitec 2.4GHz system is capable of converting most existing Hitec Module radios to 2.4GHz and utilizes the latest Adaptive Frequency Hopping Spread Spectrum technology. Other features of our system include Telemetry capabilities and our exclusive BODA(Boosted Omni-Directional Antenna) system. 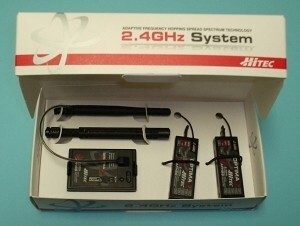 Providing the hobbyist with latest technology at an affordable price has always been Hitec's primary goal, a goal that we have now achieved in 2.4GHz technology. Module comes in combo package with foldable Antenna / telescopic universal mount. 2 each Stock # 28414 Optima 7 Receievers. Ideal for most applications the Optima 7 is the workhorse of the Optima line of receivers. Featuring full telemetry capabilities and utilizing a dual end block design the Optima 7 is slim enough to fit in the tightest of spaces. 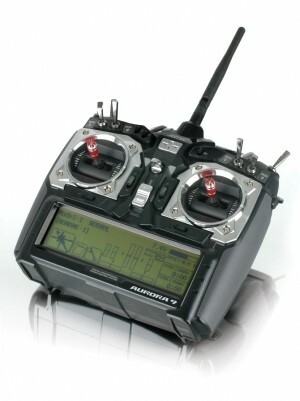 Compatible with all Hitec module type transmitters, Futaba transmitters that utilize FP-TP-FM Type Modules. Clever universal antenna mount, replaced factory antenna and works well with all TX's. 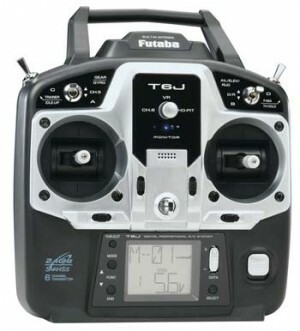 Futaba's 6J 2.4ghz radio uses Futaba's new S-FHSS system. S-FHSS RX's have more favorable pricing making this an inexpensive radio to fill up with all your aircraft. This model comes mode II (normal for USA) and with ratchet throttle for aircraft. Selectable S-FHSS and FHSS modes, the included R2006GS receiver automatically adapts to the selected mode. Airplane Features: Two programmable mixes, two 5-point throttle curves, two 5-point pitch curves, flaperon with differential rate, flap trim (2 rates), V-tail mixing & elevon mixing. Helicopter Features: Two 5-point throttle curves, three 5-point pitch curves, throttle hold, hover pitch, gyro and revo mixing, four swash plate types (H1, H3, HR3 & H3 w/AFR), swash AFR (ail/ele/pitch), throttle mix, electronic swash ring & throttle and pitch delay. 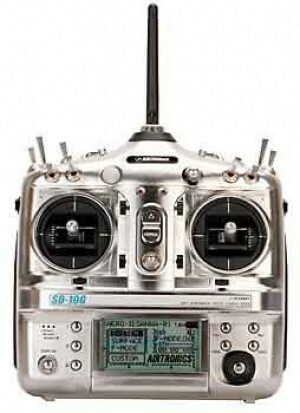 INCLUDES: Futaba 6J 6-Channel Transmitter, R2006GS Receiver and Instruction Manual, Neckstrap, Servo Tray and Mounting Hardware, On/Off Switch and ratchet spring. Four S3004 Standard Ball Bearing Servos, FUTM0004. S3004 Servo Specs: Speed: 0.23 sec/60? @ 4.8V, 0.19 sec/60? @ 6.0V, Torque: 44 oz-in (3.2 kg-cm) at 4.8V - 57 oz-in (4.1 kg-cm) at 6.0V, Dimensions: 1.6 x 0.8 x 1.4" (1-9/16 x 13/16 x 1-7/16") - (40 x 20 x 36mm), Weight: 1.3 ounce (1-5/16oz) (37 grams), Standard J type connectors with approx. 5" wire. This package for JR module type TX's only. Antenna is built onto module. Hitec is proud to introduce their first 2.4GHz products consisting of the Spectra 2.4, 2.4GHz transmitter module and Optima line of receivers. 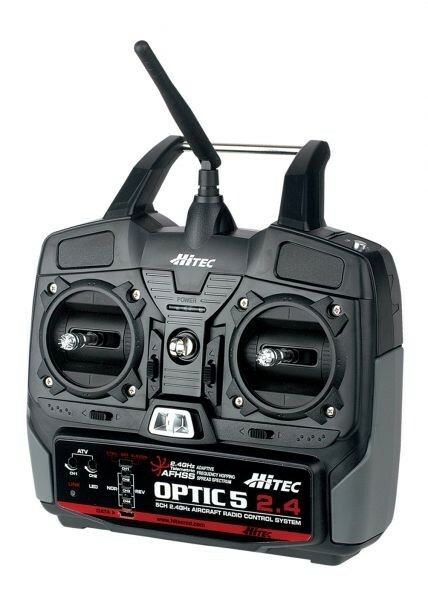 The Hitec 2.4GHz system is capable of converting most existing Hitec Module radios to 2.4GHz and utilizes the latest Adaptive Frequency Hopping Spread Spectrum technology. Other features of our system include Telemetry capabilities and our exclusive BODA(Boosted Omni-Directional Antenna) system. Providing the hobbyist with latest technology at an affordable price has always been Hitec's primary goal, a goal that we have now achieved in 2.4GHz technology. Module comes in combo package with foldable Antenna. 2 each Stock # 28414 Optima 7 Receievers. 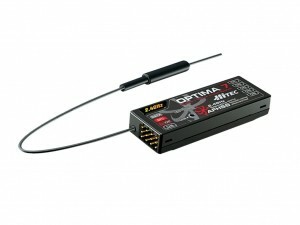 Ideal for most applications the Optima 7 is the workhorse of the Optima line of receivers. Featuring full telemetry capabilities and utilizing a dual end block design the Optima 7 is slim enough to fit in the tightest of spaces. Compatible only with JR/Spektrum Module type transmitters. Same specks are HRC29551 above except module comes with 2 each Optima 9 channel 2.4ghz RX's. Only one RX shown in photo but 2 are included. Compatible only with JR/Spektrum Module type transmitters. Same specks are HRC29551 above except module comes with 2 each Optima 6 channel 2.4ghz RX's (28410). Only one RX shown in photo but 2 are included. Compatible only with JR/Spektrum Module type transmitters.